Overclocking is part of PC tuning and refers to methods to increase the speed of transmission or processing of clock-dependent components. As a rule, the clock rate is increased in order to operate the component above its nominal clock. You can overclock the processor, the memory bus of the main memory and the graphics card. The biggest performance gain can be achieved by overclocking the processor. If you want to overclock, you must familiarize yourself with the functionality and interaction of the hardware components involved. Benefits, risks and side effects must be determined exactly. When overclocking attempts must always be expected that system components are damaged or destroyed. Therefore you should create a backup of your data before overclocking. Even better, try overclocking on a fresh system. Note: Typically, a PC needs to be 20 to 30 percent faster to let the user even notice a difference. Only in certain situations, for example, when the line between smooth and jerky video playback is reached, then you notice even slight differences in performance. Increasing the system clock is one of the oldest types of overclocking. However, it results in the overclocking of the chipset, caches, memory, system bus and all system bus dependent system components. But this only works if all system components can be overclocked. The disadvantage, the whole system is prone to instabilities. Today's PC standard components are usually not suitable for overclocking by increasing the system clock. They are subject to the same electrical values in terms of clock frequency and voltage. In addition, many PC components are almost perfectly matched to each other. There are only very few possibilities for overclocking. After a CPU has been manufactured, it is tested for its maximum possible clock frequency. Only then will it be classified accordingly. Due to the relatively high demand of slower processors (cheaper), it happens again and again that individual CPUs are marked as slow, although they could actually run much faster. This opens up scope to overclock this processor. Unfortunately, you do not know exactly which processor can be overclocked by how much. More than one or two clocks should rarely be possible. 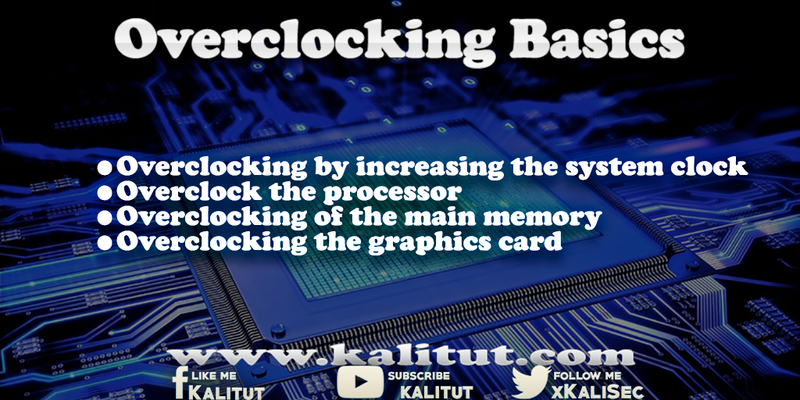 Overclocking a processor means it operates at a higher clock rate than the manufacturer intended. In principle, however, who overclocked a processor endangers the processor. It has been proven that the lifetime of overclocked processors is shortened. You should not underestimate the time needed to test the overclocked system. Nothing is more corrosive than when an overclocked processor makes trouble. Overclocked processors often make power management technologies ineffective. Another problem is the additional power loss that occurs when overclocking in the processor core. This leads to a greater heat development. This means you have to provide additional cooling. Which in turn leads to higher power consumption and noise. Attention, the PC power supply must be able to deliver more power. Not every processor can be overclocked. The Black Edition (BE) processors and the AMD FX series, as well as the Intel Extreme Edition processors, are the only processors that can be overclocked. For these processor types, the multiplier is not limited to the top. The multiplier indicates how much the processor clock is higher than the base clock. The value of the multiplier determines how high a processor is clocked. In fact, depending on his basic tact, which is fixed and can not be changed. The multiplier can be set in the BIOS of a motherboard suitable for overclocking. Overclocking the memory is one of the trickiest issues ever. Because you have to make sure that the system then works stable and correct. A memory error can lead to data loss and, in the worst case, destroy important operating system settings. Repairing such damage costs more time than the speed of the overclocked memory would have introduced. The values of memory modules that are suitable for overclocking are usually outside the JEDEC specification. They have shorter latencies and allow higher frequencies, usually only at higher operating voltage. This burdens the memory controller of the CPU or chipset and affects many electrical parameters of the memory system. With the higher operating voltage and the power consumption increases, which is why you usually have to worry about additional cooling. Most motherboards, however, do not allow the voltage for the memory modules to go hand in hand. There are special motherboards for overclockers. It is important that the motherboard and BIOS have to deal with these memory modules. Otherwise, these memory modules only work with standard time parameters and offer no advantages over standard DIMMs. Special memory modules are not necessary for overclocking. In the sometimes extremely expensive overclocking memory modules quite ordinary memory chips are installed. The colorful metal heat sinks, which are rather thin sheets, disguise which chips were used. They serve primarily the adornment and the marketing and not the cooling, as some say. The influence of fast memory on the working speed of a PC is usually overestimated. The advantage of overclocked memory is rather small. The speed increase will be felt only in exceptional cases. Without the use of memory-intensive applications overclocking of the main memory brings nothing. Faster memory can only benefit certain algorithms. These usually include scientific simulations. In principle, you do not have to worry about the speed of memory, as long as it is just big enough. Upgrading with additional memory modules is the better way than overclocking the memory. It is recommended to buy JEDEC-compliant standard DIMMs. Overclocking the graphics card is usually possible with additional tools or the graphics driver. Mostly even very comfortable under Windows. As long as the power supply remains unchanged, nothing can happen. A miscalculation of the GPU leads to at most a display error, which has only a short-term effect. Nevertheless, caution is also required here. Overclocking the graphics card can only lead to display problems, but also system crashes. Overclocking is a dangerous thing for the processor, mostly for the entire computer system. That's why overclocking is only for hobbyists and professionals who know what they are doing. Overclocking usually means operating the hardware out of specification. Damage caused by overclocking is not covered by the warranty or guarantee. So you do not overclock in the blue, you should install a few software tools. For example, CPU-Z and HWMonitor, to monitor clock frequency, voltages, and temperatures. The stability of the system is tested, for example, with Cinebench R15 and Prime95. It is recommended to get the latest versions so that the most current processors are supported. For overclocking you should take enough time to test the system for stability. For example, with compute-intensive programs, but also with the most frequently used software. In the trade one finds again and again special overclocking products. If you are interested, you should note that the hardware manufacturers earn more on the most colorful overclocking products than on the cheap mass-produced items. Therefore, all sorts of fraud can be expected here. Unfortunately, that can hardly be proven. If the motherboard manufacturers provide tools for overclocking, you should use these. Under the term overclocking or overclocking there are very many and detailed instructions on the Internet. Occasionally one finds also frequency records, which one should not aim however. They can only be reached for a few seconds. And only at low load and nitrogen or helium cooling. And yet there is always the danger that you will scrap the processor or even the entire system.